On May 10th we flew to Stockholm to see my father in law because he was sent to the hospital the day before from the senior home. We wanted to fly the day before but we were stuck on the island where we live. There were absolutely no boats and no flights available when we got the news. And it was a national holiday so we could not find any way to get to Stockholm. When we finally arrived at the hospital, he was surprisingly changed. We saw him the week before and he looked all right so I was very shocked to see the tremendous change. My father in law was 92years and was struck by a second stroke that made his whole right side paralized. He was a living legend of a health prophet in Sweden. When he was 7 years old, a doctor gave a diagnosis that he could maybe live up to 20 years old. So he was not allowed to run and jump even if he was very talented in sports. That made him want to prove to the world that if you live healthy, you can live much longer. And so he did. He became 92 years old. Yesterday on May 11th he passed away of a stroke. 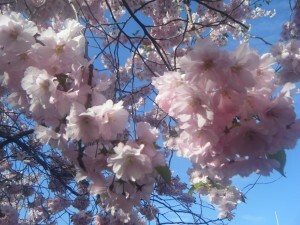 The cherry blossoms were in full bloom in Stockholm and I would like to dedicate this poem no. 33 from the original Ogura Hyakunin-isshu to my father in law. Taken from ”A Hundred Verses from Old Japan” by William N. Porter. When blossoms droop and die. 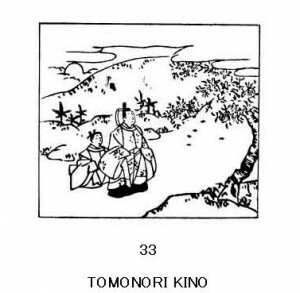 Tomonori Kino was the grandson of Uchisukune Take, a famous warrior, and nephew of Tsura-yuki, who composed verse No. 35; he was one of the compilers of the Kokinshiu, and died at the beginning of the tenth century. He refers in this verse to the fall of the cherry blossoms. Hisakata is a ’pillow-word’ for heaven, without any definite meaning in the present day; it is generally used in poetry in conjunction with such words as sun, moon, sky, or, as in this case, ’the light’ (of heaven). The picture shows the poet with his attendant, watching the petals falling from the cherry tree. Falls the cherry’s new-blown bloom? Det här inlägget postades i Japanese history and culture, Ogoola diary, Ogura Hyakunin Isshu - Japanese Poems. Bokmärk permalänken.